The closest the ingredients in these cake mix cookies have gotten to quality foods like butter and brown sugar is sitting in the same shopping cart. However, considering their humble origins, they’re surprisingly ok. Also check out the pocket oatmeal cookies. Mix wet ingredients, then add boxed cake mix. The mixture will be quite stiff and difficult to mix, so if possible use a cake mixer with a powerful motor – a cement mixer would work even better. If preferred, coat your hands with vegetable oil so the dough won’t stick and mix the dough (literally) by hand. Roll the dough into balls approximately 1″ in diameter. Place twelve at a time on an ungreased cookie sheet and mash to 1/4″ thickness using a fork. Bake 7-9 minutes at 350 degrees. Remove and cool on a rack. Passable Peanut Butter: Use yellow cake mix and add 1/2 cup peanut butter to the mixture. 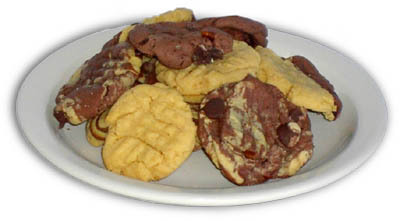 Speckled cookies: Make one batch of peanut butter dough and one batch of chocolate chocolate chip. Mash the two doughs together.